The Yamaha EF6300iSDE has been engineered to give you 6300 watts of pure pure sine wave power — it’s far superior to any conventional gas generator with an equal power rating. Why? Because it’s ultra-quiet (58 to 64 dBA) and can power any of your sensitive electronics safely; unlike traditional generators. There are a lot of reasons to invest in the Yamaha EF6300iSDE, which we’ll cover here. If you want a quality inverter generator with plenty of power, this is it. Just so you know, we’re big fans of Yamaha generators here. Anyone who has ever gone shopping for an inverter generator will agree on one thing: the range of choices out there are so many it can be bewildering making an informed decision. Different brands promise the same thing: functionality, durability, service delivery, power efficiency and so on but in a time where manufacturers can sometimes promise the heavens but deliver the earth, you’ll need to be a savvy buyer. Ideal for outdoor recreation and power outage emergencies. The most critical factor for most buyers remains that they’re not just looking to generate standby power when required, they want an equipment that will preserve the lifespan of their sensitive electronic gadgets. This is the deal breaker where many models fall short and we can’t emphasize this point enough. But, rest assured, as we’ve gone out there to take a look and made the search easier for you. With the EF6300iSDE, Yamaha shows it remains the leader in cutting-edge inverter generator technology with no signs of slowing down anytime soon. Users recommend it for its remarkable power output, fuel (gas) efficiency, quiet operation and unbeatable quality among other things. It gets even better! 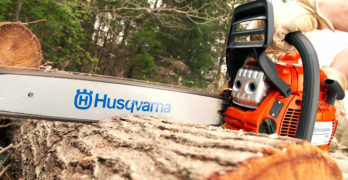 This particular model is more than enough for your needs whether camping or during a storm related outage for instance and, it’s a piece of cake to install. Comparison between conventional/inverter generators and benefits of the latter. Important features to consider when buying. Maintenance of an inverter generator. 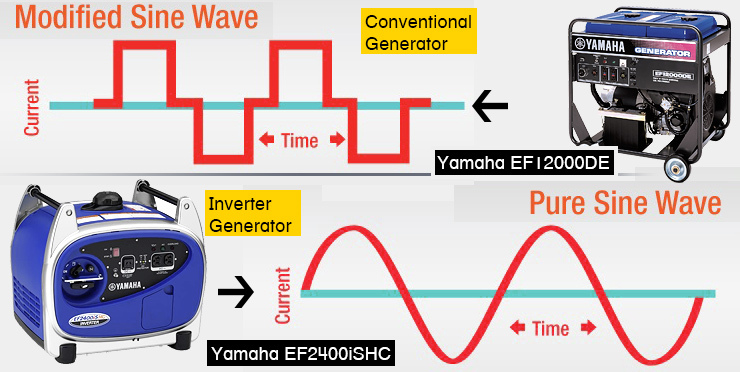 Brief outline of 2 smaller models, the Yamaha EF3000iSEB and Yamaha EF2400iSHC. Video | Why Buy A Yamaha Generator? Inverter generators are still somewhat of a novelty as the technology behind them is still new. They are 3-phase generators that produce AC current. The AC current is converted to DC and inverted back to AC power in pure sine wave that provides a stable and clean energy source often more stable and with less distortion than even electricity from the public mains. Inverter generators produce cleaner power than your home grid – safe for electronics. The ubiquitous conventional generators have been the alternative power supply of choice over the years. The basic concept is use an energy source (fossil fuel) to power a motor-alternator combination and produce electricity. This was all well and good and all that was available for many decades but these machines produce AC sine wave power which doesn’t exactly match the power received from our local transmission stations. The result was many years of complaints of lower efficiency, power fluctuations, frequent loss of power, noise, pollution and more. Also, any fluctuations whatsoever are usually transferred directly to the supply and will affect any appliances attached unless you take further steps to protect your gadgets and equipment. Inverter generators came onboard to bridge the obvious gaps left by conventional generators. They are portable generators that are easy to move around, neater to operate, compact, more efficient and durable than conventional generators. Deciding which of these to use will depend on a number of factors for and against either of them but by the time we explain its benefits, you’ll see why an inverter generator will be the obvious better choice for your needs. The conventional generators have proven to be unbelievably inefficient, especially the smaller sizes. Getting the power supplied to remain at a constant level that’s safe for your electronics often requires that you take extra precautions like using a stabilizer since they don’t surge well. This is particularly an issue when planning for the starting current for electric motors that will run off of the generator. Bigger sizes do better in this regard but will waste a considerable amount of fossil fuel when they run at less than three-quarters of their full load capacity for long periods of time. Leaving them to run at the norm of 3600 rpm whatever the load is an uneconomical option many owners have to live with. At the design stage, the objective with traditional generators is to basically get a required amount of power to where it’s needed and keep it running at that level. With big enough fuel tanks, this is not a major challenge. You can have them run for 72 hours and even much longer non-stop once fuel supply is uninterrupted. Inverter generators are designed to run for averagely 8 to 10+ hours so you’ll need to bear that in mind when you’re planning to use one. On the plus side, their fuel efficient engine design translates to a fuel savings in the range of 40% compared to their conventional brothers. As explained earlier, conventional generators are just an engine to alternator combination that will run at a speed calculated to produce the desired AC frequency. Alternator output is proportional to the load with no processing. The ‘line power’ output inverter generators produce is of higher quality and helps improve efficiency with a resultant less strain on machinery and connected appliances. Its engine works with an efficient alternator to also produce AC electricity but doesn’t stop there. A rectifier converts the AC power to DC, capacitors smooth it out and “invert” it back into clean AC power to a specified frequency and voltage. The power produced is very well regulated, consistent and clean (hence the term pure sine wave). When you consider the fact that most of the gadgets and electronics we use today, like mobile phones and laptops, come with highly sensitive microprocessors that are easily damaged with poor quality power supply, you’ll understand why a cleaner source is so important. Yamaha makes a full range of generators to match your needs. Inverter generators are surprisingly small and are being designed to get even smaller with lesser moving parts despite their power output. Many are just some inches larger than a medium sized briefcase. Many range in size from 30lbs to 50lbs. transporting them is a breeze using a car or other form of transportation. The fuel tank, wheels and metal frame alone of a traditional generator make it heavy and bulky and can be a challenge to maneuver. Do you know that the average conventional generator will produce sound levels of up to 75 decibels when in operation? That’s the same as an airplane jet engine. This is because they have to run at a constant speed to maintain the quality of power produced/desired, many times at full speed even. Hands-down, the inverter generators win here as they are designed to be as quiet as possible. They come with mufflers, quieter engines and innovative sound-dampening technology so users are often surprised at how quiet they are. Additionally, the engine can adjust its speed to match the load demanded at any point in time using microprocessors and specially designed electronics. You’ll easily find models that will run at about 50 decibels, the same sound level as an everyday human conversation. Conventional generators are at the top of the game in this regard. You can find them from as little as 500 watts output to custom made models of up to 50,000 watts and above. Inverter generators are made to be portable and quieter. Their output is much smaller ranging from 1000 watts to 6000+ watts. But don’t rule them out on account of this just yet. The parallel operation option is an arrangement that allows you to pair identical capacity inverter generators and effectively double the output. This arrangement allows you to still enjoy the benefits without resorting to the conventional models. Solid construction, plenty of clean power at an affordable price. If there’s only one area that conventional generating sets beat inverters, it’s in the area of price. No doubt about it, comparing units of the same capacity and output, inverter generators cost much more than traditional models. You need to consider if you can forgo the many benefits of models like the Yamaha EF6300iSDE just because of the price. From experience, we can safely say that in the long term, the many advantages and savings on fuel consumption are well worth the price tag. Our maintenance tips later in this guide will also help you get the best out of your investment. By now you’re probably wondering if you need one of these machines. Here are a few scenarios where you’ll want to buy one. They are indispensable for the great outdoors. Going camping, fishing or hunting anytime soon and you want to have at least some level of comfort? Buy one of these. It’ll keep your phones charged and provide other electricity powered comforts with less noise and inconvenience. You can use them in your RVs and at camping sites. The reduced noise level is an added advantage to avoid angry neighbors knocking at your door at midnight (conventional generators will get a lot of angry knocks, guaranteed). If you live in an area that has frequent storm related power outages, it’s advisable to get one. Construction workers use them a lot especially when they need to work in the early hours of the morning in residential areas. The low noise levels allows them work interrupted. Some models come with controls that easily switch automatic power saving and power-boost mode when there’s need for short surges of power. Look for models with smart control panels that help you monitor the voltage output, frequency, run time, overload warnings and so on. Though they are designed to be relatively quiet, noise levels will vary from one brand/model to the other. The load at which it’s running will also affect the noise level. Generally, you can expect them to run at about 50 to 60 decibels. Buy a unit that is easy to maintain, operate and move around. Some, not all, units come with accessories like parallel cables (for parallel operation connection), spark plug wrench and battery-charging cable etc. — How big of a generator do you need? Knowing the right size of inverter generator that will supply your power needs and still remain within your budget will save you a lot of frustration, false starts and money too. Start by checking the power requirements for every appliance you intend connecting to the inverter. Ideally, the unit should run at not more than 70 to 75% of its maximum load for extended periods of time. If you will be running a number of appliances with starter motors, it may be best you consult an expert to help you do the calculations. Below is a general guide to help you. Small Inverters up to 1KW (1000 watts) — Can power laptops (0.65KW) and other small appliances like coffee makers, mobile phones, tablets and smaller flat screen TVs. Medium Sized Inverter Generators up to 3KW (3000 watts) — These will power microwaves, hand held hair dryers, toasters, small air conditioning units and so on. Note that you’ll need to rotate appliances at some point especially when you are running the air conditioning so as not to overload the unit. Large Inverter Generators up to 6KW+ (6000 watts) — If you don’t want the hassle of constantly monitoring the overload indicators and rotating appliances, get a larger model. It will also save you from having to top up fuel at regular intervals. These sizes will power your fridge, cooker, microwave and other appliances at the same time. Remember that it’s always better to err on the side of caution and go for a bigger rather than smaller model especially if you have many people using it. 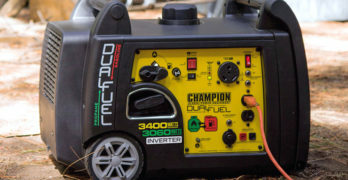 The fuel economy design of most of these inverters will match engine speed to load so you won’t lose much as compared to this same situation using a conventional generator. Learn more by reading our in-depth article : What Size Generator Do I Need? This is an expensive piece of machinery you can’t afford to mishandle. A little bit of extra care will allow you use it for many years. Here are a few thing you can do in this regard. Charge the battery at intervals. Once a month would do. Run it for about 30 minutes or just plug the battery into a charger. Monitor the display panel for any LED warning lights flashing while it’s in operation. Especially for overload warnings. If you’re going to leave it idle for a long time (6 months to 1 year), ensure you drain the oil. Use a flat and shallow oil pan to do this. Also drain the gas and use foamed oil to spray the engine and coat all the surfaces. Carefully disconnect the wires and clean them to prevent corrosion. Always keep the unit away from any source of humidity and of course, regularly wipe the exterior with a soft cotton cloth to keep it clean. With their wide range of products of which inverter generators are just one, Yamaha has maintained its lead and reputation for quality, technology, service delivery and customer support. From inception, Yamaha strives to ensure only the best technology and components are used in their products. The stringent tests on every product line see engineers testing many items to destruction. This allows them identify any weaknesses before they get to you, the consumer, so you spend more time enjoying the goods and less time on repairs and servicing. Every item that bears their brand has been tested. Indeed, they lead the market in performance and reliability. Support and products supply back-up — As expected, Yamaha customers get comprehensive support for products they buy. Their items come with warranties of different periods starting from 1 year. The supply chain is always available to get needed parts quickly to where it’s needed. Compact, well-thought out control panel and engineered for longevity. The Yamaha EF6300iSDE has been described as the most powerful inverter ever and we’ll show you why. ✓ View or download the MANUAL for the Yamaha EF6300iSDE. Engine Displacement & Power Output — This model comes with a 357cc OHV, 4-stroke engine that gives 6,300 watts starting power and 5,500 watts while running. So compared to other inverter generators, it will power multiple large appliances at the same time. We’re talking water and sump pumps, air conditioning units and even furnace blowers. It’s more than adequate for the average domestic home use and more importantly, it provides clean power that won’t damage sensitive electronic gadgets like flat screen TVs and laptops. Prior to this unit entering the market, this kind of power could only be achieved using conventional generators. Locking wheels keep this from rolling away from you. Fuel Efficiency — It comes with a compact 4 ½ gallon gas tank that will run for 13 hours at ¼ of full load. Leave it running through the night and you will have no cause to sweat till day break. Ignition — It features transistor controlled ignition. The latest technology in electric starting. The automatic choke allows for stress-free and reliable cranking. Noise Levels — Despite its power output, it produces between 58 to 64 decibels during normal operation which is the same as a normal human conversation. The lower the load, the lower the noise produced. This makes it a top choice for crowded areas and camping grounds. Portability — Compared to its massive power generation, the size is surprisingly compact measuring just 30.7” in length, 24.3” width and 27.2” height with a total dry weight of 200lbs. The wheels make the weight a bit more manageable to handle. Value for Money — Be prepared. Inverters are generally not cheap and, Yamaha is a top-of-the-line high quality brand. Expect to pay circa $3,800 plus shipping to get this beast. That been said, the whopping power it packs coupled with its durability and user-friendly features makes it a good deal any day. Consider also that compared to its close rival, Honda, it’s still less expensive. It’s the only inverter generator that features both 120V and 240V outputs. It also comes with 2 nos. 20A GFCI outlets, 1 no. 30A twist lock outlet and 1 no. 120/240V 4-prong outlet. Display panel has power and hour meter indicators. Optional Wireless Remote Control means you can fire up the unit at a distance of up to 66 feet. Low Oil Shutoff will kill the engine in the event of oil pressure loss and prevent damage. Unbeatable power supply for high-demand appliances. Quiet and highly fuel efficient. CARB compliant makes it suitable for use nationwide. Servicing can be challenging due to its compact build. — the Yamaha EF3000iSEB and Yamaha EF2400iSHC. Built-in wheels make this quick and easy to move around. ✓ View or download the MANUAL for the Yamaha EF3000iSEB. The Yamaha EF3000iSEB guarantees you premium quality clean power, remarkable efficiency and other user friendly features for your safety and comfort. It comes highly recommended by users and remains a favorite among RV owners, campers and other home owners that want power for their appliances without fail. Engine Displacement and Power Output — The Yamaha EF3000iSEB comes with a powerful 171cc OHV, 4-Stroke Single Cylinder engine and is Air Cooled for smooth operations. It produces up to 3,000 watts starting power and 2,800 watts while running. For power hungry appliances, this machine incorporates a “boost” feature that produces up to 3,500 watts of surge power. 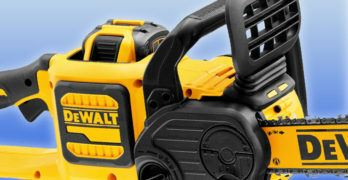 This comes in handy when you want to start up a power tool or other heavy appliance. Rated current output is 23.3A at 120V and 12V DC output at 12A. Fuel Efficiency — Like other models in this brand, this unit has unbeatable fuel efficiency. A full tank will run for at least 19 hours on the Smart Throttle function. It works by automatically adjusting engine speed to match the load. Quick Start — The QuickStart remote control allows stress-free and immediate start when batteries are charged. If the batteries are low, you can resort to the normal single-pull recoil start. Noise Levels —You know that feeling when you’re standing beside a conventional generator trying to have a quick conversation and you have to keep gesticulating and raising your voice? Don’t worry about that with the Yamaha EF3000iSEB. The 53dB rated sound level means you can carry on a civil conversation right beside it while it’s running thanks to the innovative sound reduction features like the specially designed muffler, molded fan and sound absorbent material. Can give an extra boost of 500 watts for 10 seconds for demanding equipment. Value for Money — If you want a quality generator it will cost you more money than a traditional gas generator but in the long-run it’s a great investment. Trust me, running a loud generator for hours and hours will drive you crazy, especially in emergency or leisure situations. Also, consider your neighbors who won’t appreciate the sound emanating from your yard. Inverter generators are generally not cheap and when you consider all the features and benefits that come with it you’ll understand why. Pulse Width Modulation delivers the safest possible output voltage for delicate appliances. Yamaha’s trademark Oil Watch Warning System shuts off the engine when oil pressure is low. A centralized control panel feature is included. The package comes with a battery charging cable. All the access panel functions are in easy to reach spots. Clean power can safely run all of your electronic devices and equipment. A few complaints about the remote start option. Can start most high efficiency 13,500 btu AC in temperatures up to 110° F.
✓ View or download the MANUAL for the Yamaha EF2400iSHC. Yamaha prides itself on having something for everyone and the EF2400iSHC inverter generator is proof of that. It’s a smaller backup power source perfect for RV owners or your average homeowner. But don’t underestimate it. This compact offering comes loaded with lots of benefits that will give bigger models from other brands a tough time. Let’s take a better look at it in this informative Yamaha video. Engine Displacement and Power Output — The engine is a 171 cc OHV, 4-stroke, air cooled machine that will give you up to 2,400 surge watts (starting) and 2,000 watts while running. This will support an impressive array of appliances during a blackout for instance, including power tools and smaller air conditioning units. Again, the Pulse Width Modulation gives you premium quality clean power ideal for sensitive electronics. Fuel Efficiency — This model is particularly frugal. The 1.6 gallon capacity fuel tank is designed to run for at least 9 hours on ¼ of the maximum load. The auto throttle system syncs engine speed to match electrical load so as your load drops, consumption drops too. Noise Level — If you want to have a private conversation near this machine and you’re hoping the sound from the engine will drown out your voices, sorry! Your voice will still carry over the sound because it’s the same noise level as a whisper, 53decibels. This makes it a perfect choice for lazy, quiet days at the camp ground or other outdoor where silence is desirable. Cleaner power than what you get from your home outlet. Portability — Its high power to weight ratio shows the kind of innovation that went into its construction. It weighs just 75lbs and measures 20.8” inches length, 16.5” width and 18.2” in height. You’ll worry less about moving it around. Value for Money — It currently sells for approximately $1,300 and is well worth it as the technology involved can’t be rivaled by any other brand except Honda. The start mechanism is a simple pull-start that is simple and reliable. Comes with a power panel and 2 nos. of 120V/20A outlets and 1 no. 12V DC outlet as a charging point. CARB/EPA compliant and suitable for use in all 50 states. The package comes with 12V DC cable. It runs in eco mode with no option of an override switch. Getting an inverter generator to replace your conventional one should not be so hard a decision to make. We believe the facts discussed here are the most critical ones you’ll need to consider and will help you make the right decision. Yamaha is one brand you need to seriously look at as it continues to awe with its compact models and innovations in cutting edge technology. Best of all, the peace of mind you’ll have when running your delicate electronics is something that will make life easier for everyone involved. Yes, they are a bit expensive compared to other economy names out there but the value they offer means they remain in a class of their own. If you want a cheap (and powerful) gas generator there are plenty of those out there but all generators are not created equally so it’s important that you decide upon your priorities before making a decision on which generator to buy. If you want a balanced generator that is quiet, powerful and can run your sensitive tools and electronics then I absolutely recommend the Yamaha EF6300iSDE. The only negative is that it’s expensive but if you need those specific characteristics you don’t have much of a choice but to spend the money. Visit the Yamaha site to learn more about their line of generators and power equipment.